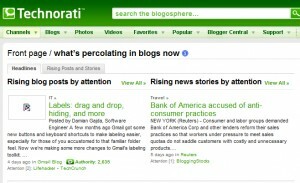 Did Technorati Just Stopped Indexing Blogs? When was the last time you’ve visited blog aggregator – Technorati? Well, it looks like the site has suddenly stopped indexing blogs. If you check it right now, the last times its index was update 4 or 5 days ago. Did we miss on any announcement about this? Is Technorati closing down, or just having a grand vacation? This was noted by CenterNetworks when it was brought to their attention that Technorati seems to be having an extended vacation. A tipster informed the site that the latest entry in PopURLs, an aggregator of blog aggregators, was showing updates of five days ago. It’s been a tumultuous month. For us – and unfortunately for you. We changed co-location facilities. We, well the four members of our ops team, moved 1,000 servers and ALL of our real-time search infrastructure. Things are now returning to normal, although slower than we would have liked. We haven’t lost any data – so when things are back to normal your link counts and authority will be exactly where they should be. We’ll follow up in more detail so you have information on exactly which services have been affected and how, and when they’ll be completely functional again. So, this probably explains while Technorati has not updated its main site to reflect new blog posts/articles yet. But then, the post was made on June 12, and the updating stopped around 4-5 days ago. So, what’s taking Technorati so long to fix the problem? Were you affected by Technorati? Does the lack of indexing updates bother you at all? Technorati indexes over 500K blog posts a day. 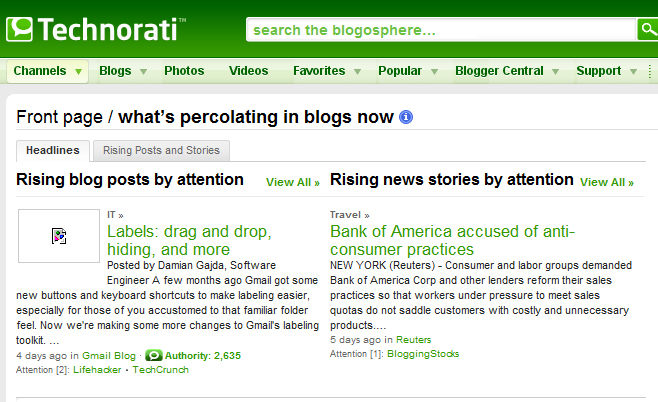 The home page of technorati.com uses our Percolator technology which identifies emerging posts and mainstream media articles based on attention from the blogosphere. Unfortunately, the percolator stalled due to a hardware failure and is being fixed. Should have updated the blog about that, but some stale data hardly suggests everything has shut down. Just run the following search for “michael jackson” and you’ll see that the first page of results are all from within the last 10 minutes. I’d say we’re still indexing blogs and providing real time search.